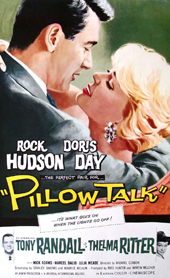 Julia Meade stars as Marie, one of Rock Hudson's girlfriends, in Pillow Talk, a romantic comedy produced by Doris Day's Arwin Productions in association with Universal Studios. It was a first for many involved. Doris Day was breaking out of her girl-next-door image, Rock Hudson was starring in his first comedy, and Julia appears in her first movie. Most fans, used to seeing Julia in television commercials on their 1950s black and white TVs, were surprised to find out that she was a dazzling red head. Brad Allen (Hudson), is a Manhattan songwriter who is very popular with the ladies, and Jan Morrow (Day) is an interior designer who lives just down the block. They share a telephone party line in which both have the same phone number. Party lines were common well into the 1960s. Jan and Brad have never met, but they know, and are annoyed by, each other's voices on the party line. Jan becomes aware of Brad's philandering, and attempts to have him disconnected, but to no avail. 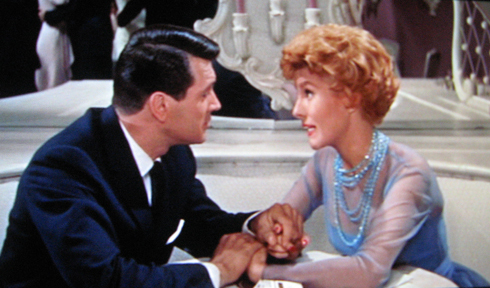 A mutual friend, Jonathan (Tony Randall), describes Jan to Brad, and by chance they meet in a club. Brad is having dinner with Marie (Meade), who is a nightclub dancer with a thick southern accent. As Marie leaves for her dancing gig, Brad realizes that the pretty girl in the next booth is Jan, and, not wishing to give himself away as the annoying voice on her party line, adopts a southern accent like Marie's on a whim, introduces himself as Rex Stetson, a visiting Texan rancher, and charms his way into Jan's life. She is completely taken by him, and travels with him to Jonathan's Connecticut house for a weekend tryst, before she realizes that he is actually Brad Allen. After a bit of fun revenge, they end up falling in love and getting married. Doris Day and Thelma Ritter (who plays the hilarious maid) were nominated for Oscars. Pillow Talk did win Oscars for best Writing, Story and Screenplay. 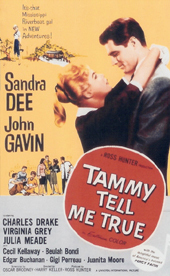 Hudson and Day were considered top male and female box office draw at the time. Julia has a lovely romantic scene with Hudson who sings a song for her as he plays the piano. She stands behind him and holds him while he sings. Julia's wide cut party dress hides the fact that she was several months pregnant with her first daughter Caroline during the filming.